در این نوشتار، وجود اطلاعات نامتقارن شامل کژگزینی یا کژمنشی در صنعت بیمه اتومبیل ایران آزمون می‌شود. فرضیه‌های تحقیق، با استفاده از روش‌های آماری مختلف پارامتری و ناپارامتری، شامل استقلال شرطی، پروبیت دوگانه، دو آزمون ارائه شده در چیاپوری و سلنی (2000) و آزمون ناپارامتری پیشنهاد شده در چیاپوری و همکاران (2006) آزمون می‌گردد. داده‌های مورد استفاده از اطلاعات پرونده‌های 69553 بیمه‌گزار بیمه بدنه اتومبیل شرکت بیمه ایران برگرفته می‌شود زیرا که استفاده از پوشش‌های انتخابی بیمه بدنه به عنوان یک بیمه اختیاری که انتخاب و ترجیحات افراد را بهتر از پوشش انتخابی بیمه اجباری شخص ثالث نشان می‌دهد. تحلیل رفتار مشتریان تکراری بیمه، تأکید بر اهمیت فرض عمومی بودن درجه ریسک‌گریزی افراد در برقراری نتایج و استفاده از متغیرهای سن و جنس برای این شرط، آزمون برقراری فرضیه انتظارات واقعی و سپس آزمون همبستگی مثبت با استفاده از آزمون‌های ناپارامتری چیاپوری و همکاران؛ و استفاده از تعداد زیادی از متغیر توضیحی شامل سن، جنس، تحصیلات و درآمد و استفاده از آمار بیمه‌گزاران از پیشبرهای تجربی این نوشتار در ادبیات شکل گرفته درباره اقتصاد بیمه در ایران است. نتایج به‌ دست آمده، نشان می‌دهد که انتظارات واقعی و همبستگی مثبت بین ریسک و پوشش بیمه برقرار بوده و در نتیجه، وجود کژمنشی یا کژگزینی در صنعت بیمه اتومبیل ایران تأیید می‌گردد. این یافته، بیانگر ناکارآیی صنعت بیمه می‌باشد. Classical theory of asymmetric information predicts a positive correlation between risk and insurance coverage. Using a sample of 69553 policyholders in Iran Insurance Company with optional items in the car’s body insurance contract, which provides significant and relevant information on the preferences of costumers, this research intends to test the prediction. Statistical tests have been conducted by the conditional independence Bivariate Probit model and Nonparametric Statistics which have been pioneered in Chiappori and Salanie (2000) and Chiappori et al (2006).The distinctive feature of the research is the use of individual data of policyholders in the oligopolistic Iran’s Insurance market. Our findings confirm realistic expectation and positive correlation in Iran’s Automobile Insurance Market (IAIM), which indicates a strict evidence of Adverse Selection or Moral Hazard in the market. These results imply inefficiency in IAIM and the existence of informationally inconsistent insurance contracts in the insurance industry of Iran. عبدلی، قهرمان؛ «اطلاعات نامتقارن و قراردادهای سازگار اطلاعاتی و کاربرد آن‌ها در بیمه اتومبیل: مورد، ایران»، مجله تحقیقات اقتصادی، 1385، شماره 75. 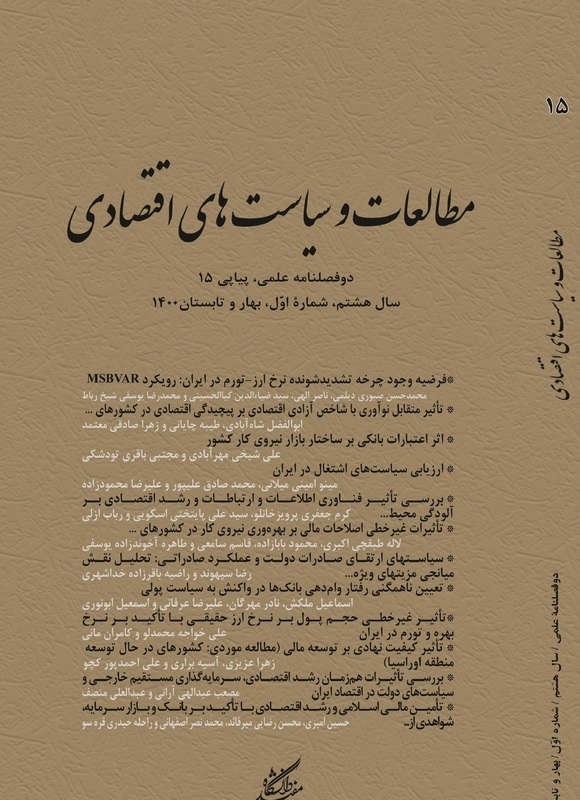 مطلبی، سید محمد موسی؛ «انتخاب مساعد و کارایی در بازار بیمه اتومبیل»، فصلنامه صنعت بیمه، 1382، شماره 3. Arnott, R., Stiglitz, J; "The basic analytics of moral hazard", Scandinavian Journal of Economics, 1988, 90. Chassagnon, A., & P.A. Chiappori; "insurance under moral hazard and adverse selection:the competitive case", mimo, DELTA, 1997. Chiappori, P.A; "Econometric Models of Insurance under Asymmetric Information", in Handbook of Insurance (G. Dionne, ed. ), 2000, 365-393. Chiappori, P. A., & Salanie, B; "Testing for asymmetric information in insurance markets", Journal of Political Economy, vol. 108, 2000. Chiappori, P.A., Jullien, B., Salanie, B, Salanie, F; "Asymmetric information in insurance: general testable implications", RAND Journal of Economics,2006, 37. Cohen, A; "Asymmetric Information and Learning: Evidence from the Automobile Insurance Market", Review of Economics and Statistics, 2005, 87(2). De Meza D., & D. Webb; "Advantageous Selection in Insurance Markets", Rand Journal of Economics, 2001, 32. Dionne, G. C., Gouri´eroux, & C. Vanasse; "Testing for Evidence of Adverse Selection in the Automobile Insurance Market: A Comment", Journal of Political Economy, 2001, 109(2). Hemenway, D; "Propitious Selection in Insurance", Journal of Risk and Uncertainty, 1992, 105. Jullien, B., B. Salani´e, & F. Salani´e; "Should More Risk-Averse Agents Exert More Effort? ", The GENEVA Papers on Risk and Insurance Theory, 1999, 24(1). Jullien, B., B. Salani´e, and F. Salani´e; "Screening Risk-averse Agents Under Moral Hazard", IDEI Toulouse, Mimeo, 2001. Kiefer, N; "Testing for Independence in Multivariate Probit Models", Biometrika, 1982, 69. Koufopoulos, K; "Asymmetric Information, Heterogeneity in Risk Perceptions and Insurance: An Explanation to a Puzzle", University of Warwick, Mimeo, 2004. Koufopoulos, K; "On the positive correlation property in competitive insurance markets", Journal of Mathematical Economics, 2007, 43. Landsbergerm, M. & Meilijison, I; "Monopoly Insurance Under Adverse Selection When Agents Differ in Risk Aversion", Journal ofEconomic Theory, 1994. Puelz, Robert, and Arthur Snow; "Evidence on Adverse Selection: Equilibrium Signaling and Cross-Subsidization in the Insurance Market", Journal of Political Economy, 1994. Richaudeau, D; "Automobile Insurance Contracts and Risk of Accident: An Empirical Test Using French Individual Data", The Geneva Papers on Risk and Insurance Theory, 1999, 24. Rothschild, M. & J. Stiglitz; "Equilibrium in CompetitiveInsurance Markets", Quarterly Journal of Economics, 1976, 90. Saito, K; "Testing for Asymmetric Information in the Automobile InsuranceMarket under Rate Regulation", Journal of Risk and Insurance, 2006, 73(2).